Wyreema farmer Warren Folker is taking the results of a very productive summer forage season to the Ekka show in Brisbane this year. Mr Folker believes that quality trumps quantity in the hay business. 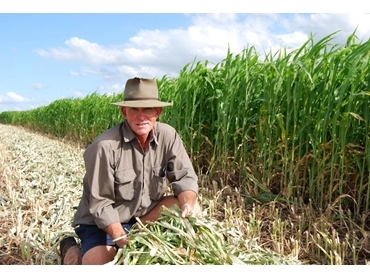 Mr Folker conducts summer and winter forage trials each year at his 138-hectare property Kilowen to provide feed for his 60 heads of cattle and his hay making operation. This summer his outstanding variety was Sugargraze, and he was able to harvest 2000 small hay bales and 220 large round bales – a large part of it will be going to the Ekka for the stud and beef producer market. His other markets include trade shows such as FarmFest and AgShow, as well as hobby farmers. Mr Folker explains that all his customers want soft, palatable hay. This season was particularly good for him –Sugargraze was the leafiest and most palatable for hay. He waited for the planting till they had good rain January through March. Kilowen received 180mm in January, 95mm in February and 77mm in March. Mr Folker used an International combine with 18cm rows to plant the seed to 20 hectares and applied 701ZN at 75kg/ha for extra zinc in the soil. He then sprayed with Primextra Gold at 3.2L/ha after planting for grass and weed control. He employs a particular method each summer to ensure the hay is just right for livestock consumption. He begins cutting the Sugargraze in mid-March and finishes in mid-April. When cut at the 1.5 metre mark, it’s nice and leafy; however, the higher it goes, the more brittle it gets, says Mr Folker. Cutting it young and fresh may sacrifice quantity, but the quality will be great. His next move was to employ a contractor to cut it to the perfect size. John, the contractor came in with his Massey Ferguson disc bine and chopped it up into small pieces about 30cm long to make it more palatable. Mr Folker has decided to continue planting Sugargraze because the width and size of the leaf meet the hay market requirements.